I am shamed to admit it, but I'm a mom who kept making her husband check the mail for this book. Should an adult be this excited about receiving a children's book? Why...yes!!! I tore open the packaging and read it immediately. I did enjoy it and I as a daydreamer could relate to Kevin and was happy to see the suggestion that his teacher gives to him in the end and what he is able to discover about himself. I love that even Kevin's parents get involved with the story. I do feel that this book is geared toward an older child with some of the situations he daydreams about. If I did read it to a child younger than 6 I would probably not read it as a bed time story. BUT, what I do see here is a fantastic vehicle to get children, especially boys, interested in both reading and writing. Don't get me wrong, this has the feel of a unisex book and it is...but boys will be drawn to it and as someone who has worked in the classroom, I know it can be a challenge to get boys interested in a story at times. Kudos for that Tiller! 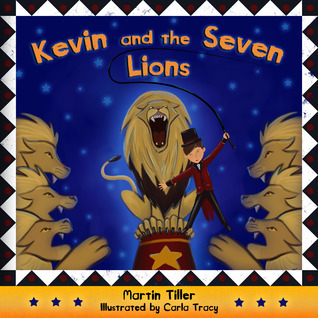 Sign into Goodreads to see if any of your friends have read Kevin and the Seven Lions.